There are an unfathomable number of causes in this world that are worth supporting and being involved in personally, financially and otherwise. Two causes in particular that our family has been drawn to are clean drinking water and human trafficking/modern-day slavery. Nearly 1 billion people in this world, right now, do not have access to clean drinking water, something that most of us take for granted and never have to worry about. Imagine what your life would be like without clean water. How would you cook, clean, or simply fill a glass and take a drink? Fortunately there are people and organizations that are working to reduce that number to zero, primarily by drilling water wells in parts of the world where finding clean water is a daily struggle, if not an impossible task. Living Water International is one of those organizations, and one that we’ve been supporting for several years now. They, and the people who don’t have clean water, could really use your help too. Check them out and get involved. Many people don’t realize that right now, today, there are approximately 27 million people in this world who are being held against their will as slaves – owned by someone else and forced to “work,” usually in some form of sexual slavery or forced labor. Evil of this magnitude is almost impossible to comprehend, but once you’ve been exposed to this truth you can no longer close your eyes, turn away, and pretend it isn’t there. It is there, and it is real. Amy and I were first made aware of slavery and trafficking when we read the book “Not for Sale” several years ago. We were shocked, and knew that we had to do something, even if it was only in an advocacy role. This led to Amy starting her blog and website A Heart for Justice, where she is doing her part to spread the word and tell people about this great evil in our day. 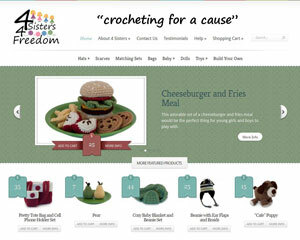 Our four daughters also wanted to get involved and do what they could to help, and the result is their e-commerce website 4 Sisters 4 Freedom, where they make and sell a wide variety of hand-made crocheted goods, donating 50% of the profits to five different organizations that are directly involved in fighting human trafficking and modern-day slavery.